The Washington Women in Jazz Festival will run February 25 – March 11, 2017 and provides equitable performance opportunities for women while uplifting the image of the jazz community and drawing in dynamic new audiences. Washington, D.C. (January 31st, 2017) — Shannon Gunn and the Bullettes, the premiere all-women jazz orchestra in the Washington, D.C., area will perform for the 2017 Washington Women in Jazz Festival at Republic Restoratives Distillery and Craft Cocktail Bar, the largest female-owned crowd funded distillery in the world, on Thursday, March 2nd from 7:00 – 9:00 PM, with big band renditions of jazz numbers ranging from classics of the 1920s to world premieres. Tickets range from $7 to $15. The performance will feature some of DC’s top female jazz players and ticket holders will receive 20% discount on the craft cocktails of Republic Restoratives. Please call Shannon Gunn at 571-318-6278 or visit WashingtonWomenInJazz.com for schedule and ticket information. The Bullettes, D.C.’s only all-women big band, find their inspiration from all-women bands such as the International Sweethearts of Rhythm and Ina Ray Hutton’s Melodears. They began as a “dream” of Shannon Gunn, trombone player and graduate of the George Mason University Masters in Jazz Studies program. Their first CD release, a five song EP, was the product of a successful Kickstarter campaign in 2011. Since then, the Bullettes continue to wow audiences and perform both swing, originals, and straight ahead jazz charts for audiences young and old. The Bullettes are a musical organization that uplifts women in jazz, creates networking opportunities for female instrumentalists, and provides a positive role model for aspiring jazz musicians in the DC area. The March 2nd concert at Republic Restoratives in Ivy City will be the first full sized big band to take advantage of the beautiful industrial distillery space in the back room. Ticket holders are welcome to attend a cocktail reception to “Meet and Greet the Artist” from 5:30 – 6:30 pm in the tasting room before the first set begins (cash bar). There will be two sets: one starting at 7:00 pm, followed by a second set starting at 9:00 pm. Separate tickets will be sold for the 9:00 set, but those who buy a ticket for the first set are welcome to stay through the second set as space permits. Tickets will be available in advance online or at the door. Tickets are $7 early bird (limited availability), then $12 general admission online and $15 at the door. Tickets are available through the Washington Women in Jazz website at http://washingtonwomeninjazz.com, Shannon Gunn and the Bullettes website at http://bullettesjazz.com, and Brown Paper Tickets. Audience members will enjoy a trek through time following the changes in style of the jazz tradition with performances of arrangements by Fletcher Henderson, Duke Ellington, Count Basie, Oliver Nelson, and Thad Jones. Following their tribute to the masters, the jazz orchestra will play world premieres of new music by band members as well as groove arrangements of recent popular music. Hailed by the Washington City Paper as “D.C.’s Best Trombonist 2015,” DC based Shannon Gunn is known for her exceptional tone and her grandiose project-du-jour. She is currently the artist in residence on Tuesday nights at Columbia Station in Adams Morgan as leader of the “Firebird Organ Trio,” named “DC’s Best Small Ensemble 2016” by the Washington City Paper. 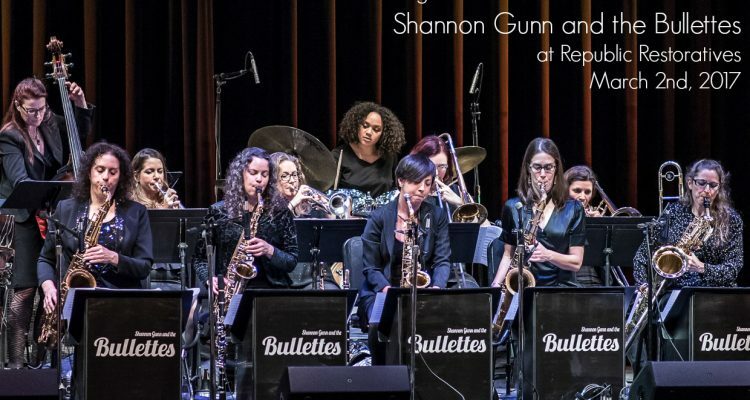 Shannon Gunn and the Bullettes have had successful performances at the Kennedy Center, Castleton Theatre House, DC Jazz Festival, and Dardanella, in addition to their yearly performance at the Washington Women in Jazz Festival. In addition to the March 2nd concert by Shannon Gunn and the Bullettes, audiences can look forward to a full slate of amazing women-led concerts as part of the Washington Women in Jazz Festival. Created by Amy K Bormet in 2011, the Washington Women in Jazz Festival creates equitable performance opportunities for women while uplifting the image of the jazz community and drawing in dynamic new audiences. Now in its 7th year, the annual festival is thriving, creating space and contributing to a global network of women musicians. On February 25th, 2017, Amy K. Bormet’s Ephemera will perform with the Capital City Symphony at the ATLAS Performing Arts Center. “Jazz up the Symphony” is the first ever collaboration between Capital City Symphony and Washington Women in Jazz, led by Tiffany Lu (Assistant Conductor, CCS) and Amy Bormet (Artistic Director, WWJ). This concert approaches the connections between two iconic art forms, classical music and jazz, from a number of intriguing angles. On February 26th, Leigh Pilzer will perform a CD Release concert for her recent album release, Strunkin’, at the Lyceum in Alexandria, VA at 201 South Washington Ave., Alexandria, VA. Leigh, voted DC’s Best Baritone Saxophonist several times over by the Washington City Paper, will perform with Jen Krupa on trombone, Sherrie Maricle on drums, Amy Shook on bass, and Jackie Warren on piano; all long-time friends and colleagues from The DIVA Jazz Orchestra, the Smithsonian Jazz Masterworks Orchestra, and the critically acclaimed show Maurice Hines is Tappin Thru Life. You can see the full line up of musicians on the events page of the Washington Women in Jazz Festival at http://washingtonwomeninjazz.com/. The event on March 2nd will take place at Republic Restoratives Distillery and Craft Cocktail Bar at 1369 New York Avenue NE in Washington, DC, 20002. 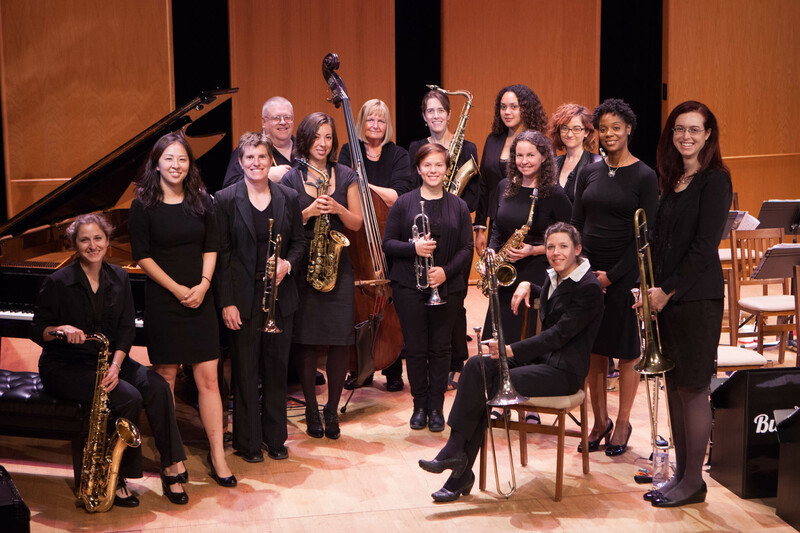 Photo Cut Line: Shannon Gunn and the Bullettes, DC’s premiere all-women jazz orchestra, will perform at the Washington Women in Jazz Festival on Thursday, March 2nd, with big band renditions of jazz numbers ranging from classics of the 1920s to world premieres.